Junior high really stinks for thirteen-year-old Vladimir Tod. Bullies harass him, the principal is dogging him, and the girl he likes prefers his best friend. Oh, and Vlad has a secret: His mother was human, but his father was a vampire. With no idea of the extent of his powers and no one to teach him, Vlad struggles daily with his blood cravings and his enlarged fangs. When a strange substitute teacher begins to question him a little too closely, Vlad worries that his cover is about to be blown. But then he realizes he has a much bigger problem: He’s being hunted by a vampire killer who is closing in . . . fast! I received this book for review having not heard a lot about it. I am glad that I did as it is was a really refreshing take on the Vampire genre and I for one really enjoyed it. Vlad is a half human, half vampire teenager who is struggling to deal with who he is in the cut throat world that is high school. He has to put up with blood cravings, homework assignments and bullies all of which make his day to day exsistence a little harder. The main thing I liked about Vlad is that ...moreI received this book for review having not heard a lot about it. I am glad that I did as it is was a really refreshing take on the Vampire genre and I for one really enjoyed it. Vlad is a half human, half vampire teenager who is struggling to deal with who he is in the cut throat world that is high school. He has to put up with blood cravings, homework assignments and bullies all of which make his day to day existence a little harder. The main thing I liked about Vlad is that it was quite black in its humour and almost quite matter of fact. The fact that Vlad is half vampire is less of a issue than the fact that he is a teenager. I liked his relationship with his aunt and his best friends and enjoyed getting into his world. 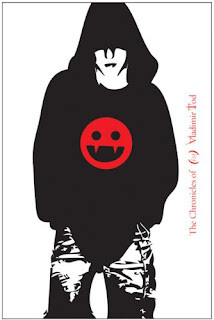 As the book progresses you start to learn more about Vlad's back story and about a world which contains vampires. I won't even begin to tell you about it as I'll spoil something for someone but I will say it gives the story a bit more depth making more than the diaryesque humorous novel it first appears to be. A fab first book in a series which has set up a lot of potentially exciting story lines (there is so much more I need to know) and a really unique take on vampires. Definitely not just another Vampire book! Only skimmed your review as I'm hoping to read this one next. I'm being buried under review books this month (or so it seems!) But it sounds like a lot of fun. Oh LOL my verification word is lament. I have that one to read next he he he. This series is one of the more popular vampire series I have seen being checked out in the public libraries where I've worked. This is especially true among teen guys. The cover of this one put me off too, and I thought it might be a little young for me. Also, when it's male POV I can never connect.